The product eForm Suite extends your TeleForm solution with the ability to create intelligent PDF and HTML forms (so-called eForms), and to process these on an equal footing with paper based documents. Data is validated on entry, encrypted, sent and automatically processed. In the data export, eForm Suite creates an electronic confirmation and personalized forms. In this way, data capturing is fully automated, transparent and legally compliant for all parties involved. Since first being published in 2003, the product has been continuously developed and updated. The current version also supports tablets and smartphones and offers offline capabilities and camera support for capturing photos. 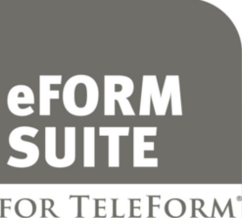 Today more than 200 organizations work with the TeleForm eForm Suite solution. With eForm Suite you open new paths of digital applications within your existing system architecture and as such, double the value of your investment. Expand your TeleForm to a unique hybrid capturing platform for all electronic and paper based capturing processes!